Peggy, the oldest yacht in the British Isles, has been moved for the first time in 200 years. The move by crane, carried out by conservation experts in the yacht’s home in the Isle of Man, followed a tense few weeks when high winds almost scuppered the project. The boat was built in 1791 and is in need of urgent conservation work. *Peggy *is the only surviving shallop, a type of light boat used for rowing or sailing in shallow water, typical of the 17th and 18th centuries. She was built in 1791 and was fitted with sliding keels, one of only a few with this 18th century innovation. 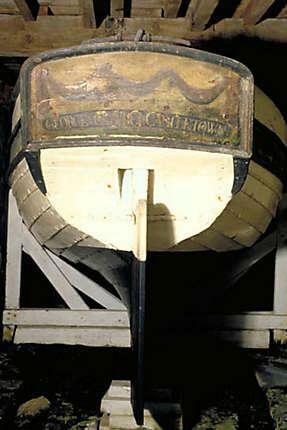 Peggy was discovered in the 1930s, entombed in her original boat cellar, where she had lain for more than a century since the death of her owner George Quayle. Manx National Heritage, the organisation responsible for protecting and promoting the Isle of Man’s heritage and culture, has been making preparations to move the boat for some time. She has been kept in a cellar within the Nautical Museum in Castletown in the south of the Isle of Man but now will be taken to a climate-controlled conservation facility in the island’s capital, Douglas, which was recently purchased by the Manx Museum and National Trust. Once there, *Peggy *will be stabilised, examined and conserved. Christopher Weeks, Objects Conservator, Manx National Heritage, says, “*Peggy *requires urgent conservation work. The humidity of the new surroundings has to be lowered carefully in order to retard the corrosion of her iron fittings without damaging her timbers. At the same time preservation work on her painted surfaces will also commence. The island's Nautical Museum will also undergo partial redevelopment with a new Quayle Gallery, telling the story of George Quayle and his family as well as the Peggy. Recent archaeological investigation and archival research has established that the site was home to possibly the earliest slipway in the British Isles and that Quayle subsequently replaced this with a private dock, which acted as a sea lock.